I have a 2004 MT RX8 that has been running great. I had to disconnect the battery for a stereo issue and when I reconnected the battery the engine would stall every time I took my foot off the gas instead of just going to a normal idle. I found a few posts addressing this issue that basically said the car needed to be driven for a few days to (I think) reset the fuel map. I also tried resetting the NVRAM to no avail. After a few days and a lot of frustration having the car die at every stoplight I found a solution to the problem I thought I would share. When I got home today I held the throttle at about 700 RPM and noticed the RPM dip down around 500 and then speed up and hold around 1000 RPM. I let up a little (very little) on the gas to go down to about 700 RPM again and held it. Same thing, after a few moments the engine RPM sagged and then sped up again to around 1000 RPM. I kept doing this until I could take my foot completely off the gas pedal and wallah, perfect idle. 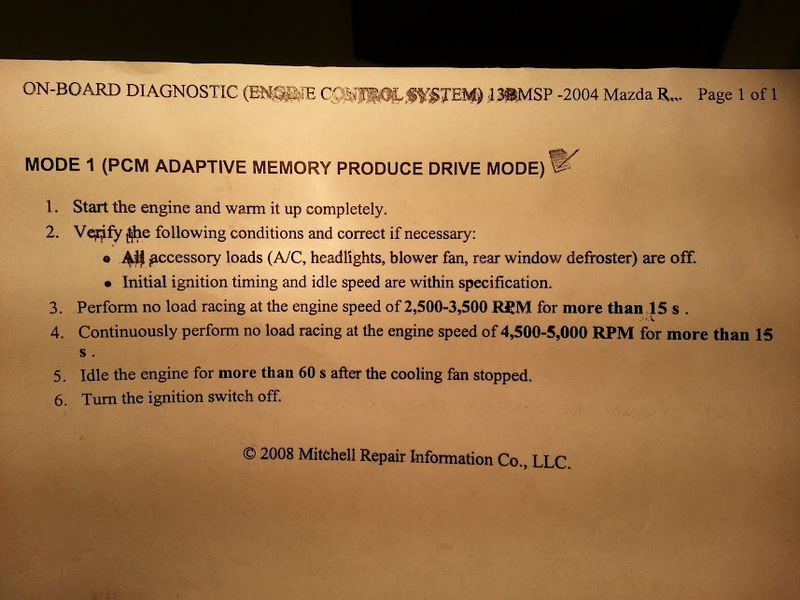 I'm guessing this somehow helped the computer fix the idle speed. Hope this helps anyone else who has had this frustrating problem. I've disconnetted the battery yesterday to try to recharge it with a recharger I borrowed from a guy with lower power than the battery. I hope to don't have the same issue...by the way...do you think it will work? (I mean recharging the battery) because the issue is that I flooded and because the car was not turning on, I didn't use for a while. Could you please give me some advice as I'm a new driver of this car? I'd be interested to hear Charles, MM's or even Teams take on what really happened here. Maybe it had something to do with the computer re learning the driving parameters? Usually after I disconnect the battery the car idles rough for about 5-10 minutes worth of driving then its great from then on out. Not sure if this is something the 8 goes through but I'm not sure what else it would be. Sounds like an under charged/Bad battery. Did you check it? 2004 mazda rx8 38k Engine light on and no much power and smoke. Disconnected battery, changed coils, cables and spark plugs.. Worked fine but died after at stop sign. Did what my8rox recommended and MAGIC!!! Works great. Thanks you!!! The dealer would never recommend this..
what happens is that the ECU has a fuel trim at idle, and it needs a few minutes for it to set enough to allow the car it idle, sometimes. some cars actually run fine right away, it just depends. LTFT & STFT High free revving must've been what it needed to swing one or both in the right direction. this was totally weird for me..
i disconnected the battery and left it off for around half an hour, then i connected it back up and let the car idle until the temp needle was sat in the middle, then i shut it ff and done the 20 brake stomp reset. then restarted the car and let it sit and idle again for 15 mins without touching a thing, i could actually hear the idle getting better and better until finally it was back down to normal idle, and tbh it was alot smoother on idle. I got this from my mechanic (Sammy at Stillen). I don't know where he got it or how nobody here has ever seen it, but this works every time for me and its so simple. THERE IS NO NEED TO DRIVE AROUND FOR HOURS OR DAYS TO FIX THIS, it only takes like 5 minutes. and that's all folks, as easy as it gets. Yep, vary from an RX-8 to another specially ones with a higher mileage older battery, plugs, wires, coils, etc. It may take one cycle or five cycles. A cycle consist of starting the engine after it has cooled down and letting it warm up to at least the third tally mark in the dummy-TEMP gauge and turning it off to allow the engine to cool down. From my experience, the Air Pump doesn't engage during those cycles when the ECU relearns the trim, only will it turn on once it has completed the procedure. Thank you jamminman, worked perfectly! banged my head like this after my bat went dead and tried to start it of a rx8>>>as for im new and read all the help....on this forum.I disconnected the bat,Charged it for a hour and installed it back in the car. Ignition on turned wheel all the way right all the way left ...and started...all was good. Drove it and about 30km she decided idling was for the birds. Returned home disconnected the bat, 10min or so, did all above but this time I pumped the brake 20 times, the car was still hot so started and brought the rpm s to 2500 for 20sec or so...then 4500 20 sec or so...she idled on 500...nipped it up to just under a 1000 for a min and let go,idled her for 5min on her own....and now its fixed like new.I do have a funny issue with my steering at times goes hard but only when im turning left..any ideas. You found this by searching, do the same by using the keywords: "power steering". I have the same problem. I think it's that the radiator overflow hose dumps hot coolant onto the steering rack connector, and over time it gets corroded. It hasn't bothered me enough to get it fixed, but basically you undo the wire harness from the steering rack, clean the connectors with a wire brush, and then seal up the connection. Also consider relocating the coolant overflow line. Thanks for the info I was so glad when i tried this and it worked. The guys at Mazda said it would cost about 300 bucks or more, but I tried this advice and its fixed!!!! I trued this advice and its all fixed great!!! I just have 1 noob question about point 3. and 4. Should I hold the revs between 2.5k-3.5k rpm, wait 15s and them add more gas and hold it between 4.5-5k rpm for 15s and then lift, and proceed to point 6. ? Does it restart easily once it stops? Could be a few things, but the most important question is did you get an inspection AND engine compression test before purchase. And if not, you may want to return this car if possible and start over. Especially if the engine is hard to restart after stopping, your engine could be on its last legs. A quick option is to start it cold, and leave it idling until it warms up, then drive easily for a bit. This triggers the learn process for the engine. Disconnecting the battery for a bit beforehand may help.